AllTimePrint cannot, and does not, check any submission for spelling, grammar, or any other errors. The design will be printed as it appears during the approval step. It is the sole responsibility of the customer to ensure that all materials submitted for printing are formatted correctly. Printing errors attributed to the customer are not subject to free reprint. Customer may correct their issue and reprint the order at 75% of the cost for each reprinted item. Errors caused by AllTimePrint will be reprinted and shipped free of charge. AllTimePrint will do its best in having products delivered on time. However, AllTimePrint assumes no liability whatsoever to customers for any lost business or other damages, real or constructive. Buyer assumes full risk of possible delivery delays. AllTimePrint cannot be held responsible for any inability to print on the product after purchase. AllTimePrint's products are often coated and can be difficult to print on. UV coated products cannot be printed on, while matte covered products may require commercial printers. Please test using a sample and verify that your printer will work before placing an order. Samples can be ordered online for free. Problems printing on products using after-market printers is not a valid reason for refund or reprint. .
AllTimePrint does not refund, cancel or credit if the service failure is caused, in whole or in part, by: Acts of God, weather conditions, environmental or dangerous goods incidents, perils of the air, public enemies, public authorities acting with actual or apparent authority, acts or omissions of customs officials, authority of law, quarantine, riots, strikes, work stoppages or slowdowns, or other labor disputes or disturbances, civil commotions or hazards incident to a state of war, local or national disruptions in ground or air transportation networks or systems due to events beyond our control, disruption or failure of communication and information systems, disruption or failure of utilities, or other circumstances beyond our control. 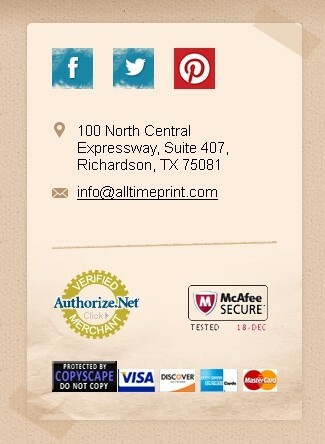 AllTimePrint will never provide your credit card or other payment details to any third party. Color fidelity warranted by AllTimePrint is consistent with industry standards for "pleasing color." AllTimePrint offers no guarantee of "match-print" or "match-product" color fidelity. AllTimePrint cannot prevent slight color drift throughout an order. AllTimePrint cannot calibrate the customers computer monitor and therefore does not guarantee that the color printed will match the preview as it appears on the customers monitor. Refunds are not given for products in the customer's possession greater than 30 calendar days. All the orders are custom made, and this is the nature of the printing industry. If a customer need to cancel the order during production, AlltimePrint will charge 25% of the total payment. Orders can not be cancelled or returned after shipping.